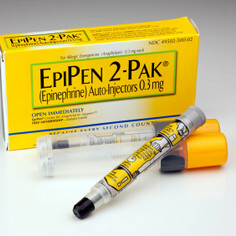 Please sign this petition on Change.org in support of the Emergency Access to Epinephrine in Schools Act. In honor of Sabrina Shannon, Megan Ayotte Lefort, Katelyn Carlson, and Ammaria Johnson who died of their allergies, children in schools should be given access to life saving epi-pen injectors in the event of an allergy whether there is an action plan in place or not. Children with food allergies are at risk for anaphylaxis, a serious life threatening reaction that can rapidly close the airways of a child, causing death. Nearly 6 million American children have potentially life threatening allergies. Many families do not know that their child has a life threatening allergy until the first reaction, which can be deadly if not treated quickly. This is why it is important to be certain that life saving Epi-pens can be made available at school to all children in the case of an allergic reaction. The lives of the above listed children, and many other children, might have been saved if an Epi-pen was available to them. Signed the petition and wrote to both my senators. Thanks for all you do! Good to know of all the medical updates round the world...there are some countries which are more advanced than others but surely if one starts being progressive very soon the rest will follow.